The old standard - back to the garden! We have seen so many miles, places and people since my last update, I can't try to capture it all. Time has flown by incredibly fast - we'll be home again next Thursday. But I received several significant impressions that the Lord has given me during our travels. This is the first one. I would like to pass a couple of others along one by one. Moses' striking the rock instead of speaking to it resulted in his being barred from entering the Promised Land. I've always thought that was a pretty harsh punishment for getting angry with such an unruly mob that even God Himself was ready to fry them all! After all, Moses stuck it out with them, and even stuck his own neck out for them, during all of those forty long years. So I have always been puzzled about what God's reasoning might have been. And perhaps I'm not the only one to wonder about this. In Deuteronomy 4:20-21 Moses explains to the people, "But the Lord has taken you and brought you out of the iron furnace, out of Egypt, to be His people, an inheritance, as you are this day. Furthermore the Lord was angry with me because of you, and swore that I would not cross over the Jordan, and that I would not enter the good land which the Lord your God is giving you as an inheritance." As I read the story this time, it hit me like a thunderbolt that God's command to Moses was that he speak to the rock. In his anger he took action and struck it, but God had clearly instructed him to speak. He had wanted Moses to model relationship, not activity! All of the law was full of things to do and not to do, but I believe God was wanting Moses to demonstrate a relationship with the living God, not some kind of physical action or emotional response! The Lord was seeking a relationship since the very beginning in the Garden of Eden, and that was interrupted by Adam and Eve's disobedience. "Speak to the rock, Moses, don't hit it! It's not difficult to see this tendency still at large in the church today. We so easily get involved in activities and programs and just doing stuff, rather than spending time in direct relationship with God. How can we bring "a psalm, a hymn, or a spiritual song" to our fellowship if we're not spending the time with God first? The apostle's exhortation in 1 John 1:3 reminds us, "...that which we have seen and heard we declare to you, that you also may have fellowship with us; and truly our fellowship is with the Father and with His Son Jesus Christ." May this serve as a good reflection for us all to ponder in our own lives! Surprise blessing - a visit to America and Canada! Six weeks ago we had no idea where we would be today. The Lord has blessed us in an extraordinary way and answered our prayers to travel and see family. 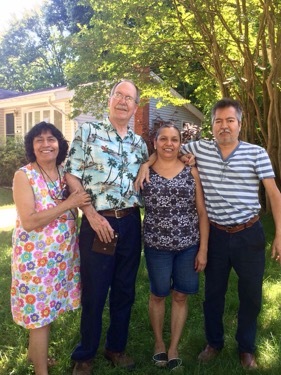 Two weeks ago we landed in Washington DC where Gladys has family that she has been longing to see. We spent a week there and it was a fantastic opportunity to catch up with part of her Guatemalan family there. It was a wonderfully refreshing time for us all, and laughter resounding from sunup to sundown was some wonderful medicine! While Gladys was in Washington, I made a quick trip to New Orleans to get some more dental work done. I returned on Wednesday night, and the next day we flew to Billings, Montana where we stayed overnight with our son Peter and his girlfriend Allie. 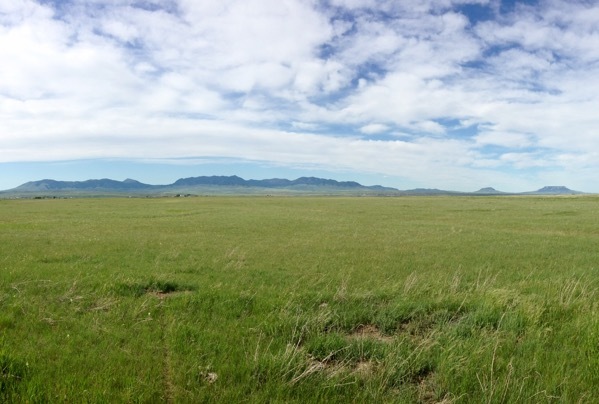 And then Friday we started the drive north towards Canada and enjoyed countless fabulous views of the great plains! An incidental blessing during our time in Washington was that it was Gladys's birthday. So there was a get together with the whole family on Saturday, and then we went out for a lunch with her niece and husband and their daughter on Sunday. So there we were in the United States with a Guatemalan family having lunch at a Peruvian restaurant. How funny is that! When we first realized we would be able to visit our son in Montana, we remembered that our dear friends Bryn and Silvia, who were with us in Wales three years ago, lived a day's drive to the north. They had been given a burden to come pray in Wales, got in touch with us and then came over for about six months. So it was a joy for us be able to come spent some time with them here, where we are now. 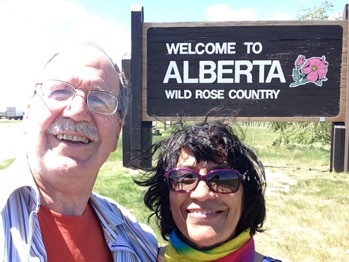 Last fall they were led to open up their home as a house of prayer here in Vulcan, Alberta. So it has been our privilege and pleasure to spend time with them, and learn of their work here. What a blessing to join in the intercession for this part of Canada, and meet others that come from different churches to pray together. The church in this area has been struggling with division and disunity for generations it seems, and they are praying with one purpose - to see the Lord restore wholeness to the church and bring revival to this land. The wide-open places and expanse of land here are incredible. We drove around quite a bit yesterday and were able to get an overview of the area. It's not difficult to understand how the enemy can easily keep people separated when the physical distances are so great to start off with. So please join us in praying for these faithful saints as they pray and seek God for a real work of the Holy Spirit in this area, joining hearts together and uniting the troops to see revival and a real manifestation the glory of God birthed in this land in a definitive way. As the group here is picking up steam and others are joining ranks, we hope to be able to impart a blessing and encouragement to them based on our own years praying in Wales for revival. We never would've imagined being where we are today, and we are thrilled and humbled to see God opens such unexpected doors for us. 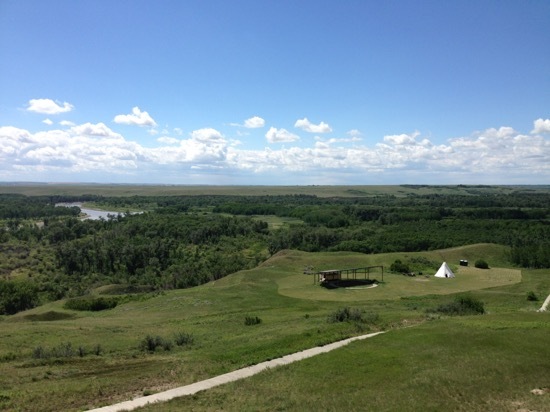 On the north side of Vulcan County and one of the primary objectives of their prayer here is the Blackfoot Indian Nation, the original inhabitants of the land. Much as the situation in the USA, they were displaced by incoming settlers and have struggled with many issues, not least among them those of identity and self-worth ever since. In our meanderings around yesterday the Lord orchestrated a meeting with an indigenous sister in Christ who could provide a valuable link. She is a historian and teacher of cross-cultural relations and is hungry for real fellowship. Please keep her and her nation in your prayers. It was fun to watch how Gladys connected with her immediately because of her indian blood!